A host of state officials are meeting with the Feds today to find out if Metro's awesome Silver Line to Reston, Dulles and the wastelands beyond can be saved. The $5 billion project needs $900 million in federal money to move forward, but backers say they are alarmed that reservations among Federal Transit Administration officials could scuttle the plan. The FTA is to decide in the next week whether to approve money for the rail line. In phone conversations with the congressional delegation in recent days, Simpson and other FTA officials said a main concern is whether the Metropolitan Washington Airports Authority has the experience and technical staff to manage the complexities of a 23-mile extension to one of the nation's largest and busiest transit systems, according to the lawmakers' letter. 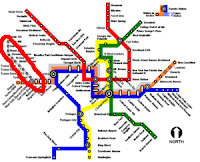 FTA officials also questioned whether Metro is financially positioned to operate the new line in addition to its existing system. The officials said they wondered whether the Dulles Toll Road, which is operated by the airports authority, can generate enough money to pay for the rail project's second phase from Reston to the airport, which is the current financing plan. Hmm. Well. Other than the occasional track fire and wardrobe malfunction, we'd say that Metro is right as rain. Fortunately, all that grassroots developer-backed under-not-over nonsense has been squared away, right? Project backers also say they are worried about continued efforts to put the rail line underground through the Tysons Corner portion of the project and whether that is slowing the approval process. Kaine decided in 2006 to forgo a tunnel despite broad public support because of the risk of adding costs and delays. But last week, two Northern Virginia officials, state Sen. J. Chapman "Chap" Petersen (D-Fairfax) and Fairfax Supervisor John W. Foust (D-Dranesville), sent letters to the FTA urging a "time-out" so the tunnel idea could be studied. Great idea! Just keep clapping, kids, or that "time-out" will be spent in perpetual Toll Road gridlock.